loveDANCEmore held their first MUDSON performance event Monday night, inspired by weekly Monday performances at Judson Church in New York that began in 1962. The MUDSON performance featured works-in-progress from various choreographers and dancers. 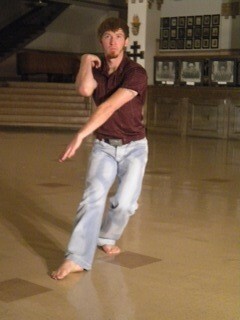 The first to perform his piece, see line, was University of Utah MFA candidate Matt Beals. With music by Nina Simone, the piece was created around an imaginary story, incorporating ideas such as "pretending to love and pretending to be loved." Beals' movements had a relaxing, laid back quality to them, including many smooth movements of the arms. Following see line was something performed by Movement Forum (MoFo). MoFo is an improvisational company that does next to no choreography before the performance. The group danced alongside a plethora of magazines: reading them in interesting poses, balancing on piles of them, even kicking them across the floor. At one point two female dancers were battling over the chance to read a magazine. Last in the program was Katie Meehan, a senior in the Modern Dance Department at the University of Utah. Her piece, jane, jeanette & stanley, featured film as well as dancing. Meehan danced alongside the film screen as narratives played speaking of laughter in a dress, white wig, and sneakers. The performance series continues on October 18 with the release of Learning to Love Dance More: a performance journal. For more information visit loveDANCEmore's website.